26 January 2011 may seem a long way off as we prepare for Christmas 2009 but in fact it is just over one year away. 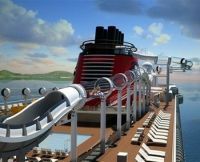 Cruise aficionados will already be looking at their calendars and noting that a new floating palace for children will make its maiden voyage on that date. The Disney Dream is the first new Disney cruise ship since Disney Wonder entered service in August 1999, joining Disney Magic introduced a year earlier. 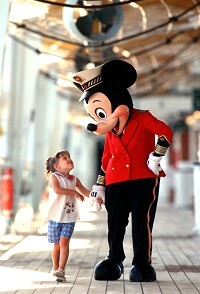 In 2012 Disney Fantasy arrives. 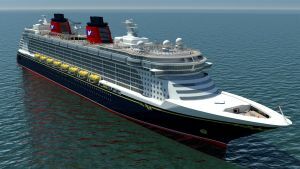 The two new Disney ships are a great deal larger than the earlier vessels at 126,000 tons, over 1,000ft long and each featuring 1,250 staterooms. The Disney ships have been a resounding success mainly operating in the Caribbean and normally calling in at Castaway Cay, a private island in the Bahamas designed as an exclusive port of call. The ship actually berths at Castaway Cay saving the usual problems associated with using tenders. Mickey and his friends are ready to entertain the children but parents are looked after too. One of the three glorious beaches is designated “adults” only. And there is even better news for those who need a Disney fix but don’t like the idea of flying to Florida. In 2010 Disney Magic is crossing the Atlantic. Disney Magic is about the same size as the original Queen Elizabeth (83,000 tons), has two funnels and can carry up to 3,000 passengers. In these “eco times” one funnel is a dummy which includes a teen centre called Aloft. Sounds fun. On a series of 13-day cruises out of Dover, Disney Magic will overnight in St Petersburg, giving guests plenty of time to experience the city known as the "Cultural Capital of Russia". Copenhagen, Oslo, Stockholm and Warnemunde, the gateway to Berlin, are on the list of ports visited. At Warnemunde the train to the German capital sits actually at the dockside waiting for its passengers. Departing out of Barcelona, Disney Magic will sail four 10-night and four 11-night cruises in the Mediterranean in April, May, August and September. 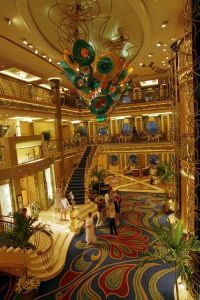 Let’s stay with the adult theme when taking a look at Disney Dream. Just like its sister ships, whilst the children are having the time of their lives in the elaborately themed youth areas, adults can look forward to incomparable indulgences and relaxation with exclusive areas and offerings designed exclusively for them. Wither you are parents, grandparents, or even great grandparents, Disney will look after you, away from the kids. However there is one negative for some. Gambling is banned on board. If your pocket does not run to the balcony cabins do not fret. All inside staterooms on the Disney Dream featuring a Virtual Porthole that provides guests with a real-time view outside the ship. High-definition cameras placed on the exterior of the vessels feed live video to each Virtual Porthole. At night adults can escape to The District on Deck 4, a night time entertainment area with five unique venues. There is Cove Café, District lounge, Metro Pub, Skyline and Vista Café. Everything for grown ups has been thought out, after all it is them who are paying for the trip. Palo is a unique dinner experience at sea offering ocean vistas with a pianist softly serenading guests. The Senses Spa & Salon again offers adult tranquillity with 17 private treatment rooms, spa villas with indoor treatment rooms and private outdoor verandas, and Rainforest, a special section of the spa offering the benefits of steam, heat and hydrotherapy to relax the mind and body. At the end of the day however well the adults are treated Disney is fun ships for children. Without doubt unique is the AquaDuck! Guests will get swept away on an exhilarating high-speed flume ride featuring twists, turns, drops, uphill acceleration and river rapids all while traversing the upper decks of the ship. AquaDuck stretches 765ft in length – more than two and a half times the length of a soccer pitch – and spans four decks in height. Guests slide 13ft over the side of the ship in a translucent "swing out" loop allowing them to look down on the ocean 150ft below! They experience coaster-like thrills as high-powered water jets push them upwards and forwards at 20ft per second. AquaDuck continues through the forward funnel, encounters a 335ft stretch of river rapids and splashes down to an end on Deck 12. Whether parents (and indeed grandparents) will want try AquaDuck remains to be seen. Repeated on the new ships Disney's Oceaneer Club and Disney's Oceaneer Lab, children ages 3-12 years old play in spaces fuelled by Disney storytelling and participate in a variety of activities hosted by specially trained, caring Disney counsellors. From pirate training with Captain Hook, do-si-do-ing with Snow White, a slumber party with Goofy and much more, kids are immersed in Disney fun that will be remembered for years to come. Disney also offers the longest operating hours at sea, so the fun doesn't have to end for kids; and parents can also enjoy a night out knowing their kids are well taken care of and having a ball. The clubs are open continuously from 9 a.m. until midnight and provide kid meals during lunch and dinner hours at no extra charge. The list goes on and on. They can play among larger-than-life characters from "Toy Story" in Andy's Room; Explore the Laugh Floor with loveable monsters Mike and Sully from "Monsters, Inc" and dive under the sea with Nemo and friends or visit Tinker Bell's fairy forest. At Disney’s Oceaneer Lab, children feel as though they are embarking on a great seafaring adventure in a room filled with maps, maritime instruments and swashbuckling artefacts. Here youngsters can try their hand at animation, become a pop star or navigate ships through digital seas. Teens have their own exclusive club aboard the Disney Dream with Vibe, a trendy and inviting indoor/outdoor space created especially for guests ages 14 to 17. A ”teen-only” swipe card provides access to the nearly 9,000sq ft club. They can create and edit videos, play computer games, access the onboard social media application or try their hand at spinning and mixing dance tracks. Teens have their own private outdoor deck area with chaise lounges for sunbathing, two wading pools, misters and pop jets for cooling off, and deck games such as ping-pong and foosball. Disney Cruise Line continues its innovative rotational dining concept onboard the Disney Dream with elaborately themed restaurants, distinctly Disney touches, and world-class cuisine to create a magical dining experience. Throughout the cruise, guests rotate through three different restaurants for dinner with their servers accompanying them, providing guests with friendly, familiar, personalized service each night. Disney Dream is scheduled to depart on its maiden voyage from Port Canaveral, Florida 26 January 2011. 2010 could be a boom year for the UK cruise industry in spite of the prevailing economic outlook. At least 16 new ships are expected to be introduced and those dedicated to the UK market include P&O Cruises' Azura, Cunard Line's Queen Elizabeth and Celebrity Cruises' Celebrity Eclipse. P&O have announced just in the last few days the resurrection of the name Adonia, with the re-badgeing of Royal Princess with just 700 passengers the smallest P&O liner for many years.